PowerDirector 11 Ultra provides the easiest and fastest way to create home videos. 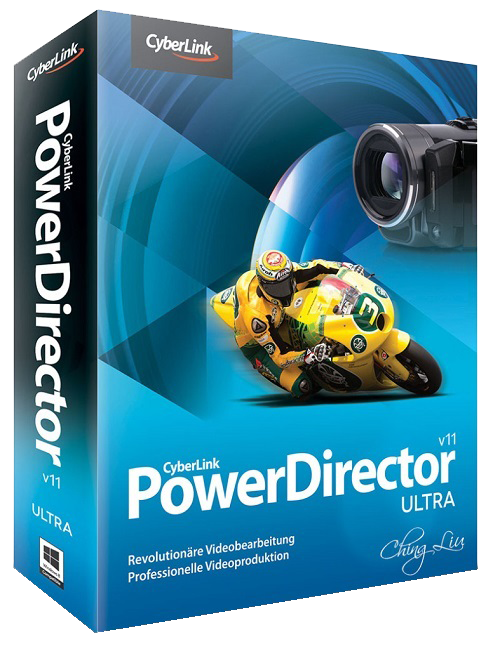 Packed with innovative video technologies to automate and speed up video processing time, PowerDirector 11 Ultra comes with more than 100 built-in effects and access to more than 300,000 free effects at CyberLink’s DirectorZone.com online community, allowing you to create pro-looking home videos with ease. PowerDirector Ultra also includes PowerDirector Mobile for you to create videos on-the-go with your Windows® 8 Tablets. PowerDirector 11’s Content-Aware Editing provides a revolutionary way to edit video projects. The advanced built-in technology magically analyzes major scenes, such as those with faces, motion, zoom or pan, and hones in on imperfections that can be improved using TrueTheater®, such as poor lighting, and shakiness. Editing videos is now easier, faster and more efficient than ever. PowerDirector 11 is the first and only consumer video editing software to support end-to-end editing of 4K ultra HD video format. Supports import of 4K videos from the latest camera devices, edit more efficiently with TrueVelocity and produce breathtaking 4K movies on disc or publish online right from your desktop. Need more tools to help make your production look unique? PowerDirector 11's new Design Studio tools come with four new designer tools: Title Designer, PiP Designer, Particle Designer and Menu Designer. You can use the full screen editing interface and timeline for a more accurate animation design, or overlay particle effects over titles. Apply reflection effects to title text or PiP objects, or use the 4-color gradient to make your title text really stand out. TrueVelocity® 3 now supports multi-GPGPU so you can maximize performance from multi-graphic cards installed and optimize editing, rendering and effect processing speeds. Operating System: Microsoft Windows® 8, 7, Vista or XP (Service Pack 3). - Adds the MPEG-4 AVC production profile for Sony PS Vita. - Adds the following output resolutions for H.264 AVC, WMV, MPEG-4 and MKV file production: 2048 x 1080, 3840 x 2160, and 4096 x 2160 for 16:9. - Adds support for editing GoPro HERO3 clips. - Adds 7 transitions to the Transition Room. - Improves program stability in Create Disc page and when burning AVCHD discs. - Improves program stability with specific Intel graphics card drivers. - Improves frame accuracy with some CABAC parameters in H.264 AVC file production. - Improves program stability in Batch Produce. - Improves program stability when saving PiP templates. - Improves program stability when importing projects with ColorDirector effects. - Resolves issue where 3D MVC files become 2D after production when Intel hardware encoding is enabled. - Resolves issue where photos in slideshow are stretched when face detection is enabled. - Resolves issue where fade effects cannot display correctly when modifying Particle templates.